To kill common household ants, simply place TERRO Liquid Ant Baits stations near indoor areas where ants are spotted. Ants enter the trap, consume the liquid ant bait and return to the nest where they pass on the bait to the rest of the colony. 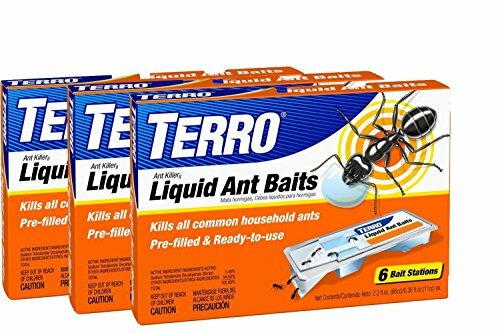 TERRO Liquid Ant Baits are specifically formulated to allow worker ants to consume the product and survive long enough to carry the liquid back to the nest and deliver a dose to the rest of the colony . The liquid ant bait stations prevent the bait from drying out and provide the ants with a continuous supply of liquid, day and night. Monitor the baits regularly for activity, but do not interfere with the ants or baits. Replace with additional baits when the first set is depleted. Depending on the size of the ant infestation, complete control may take up to two weeks. If you have any questions about this product by Terro, contact us by completing and submitting the form below. If you are looking for a specif part number, please include it with your message.